‘Eastern Europe has been really trendy. Prague is the best-preserved city in the region … and the best beer in Europe lands on your table there for 50 cents.’ Rick Steves, American travel writer summed up perfectly Prague. Stunning place. Delicious beer. Budget weekend. 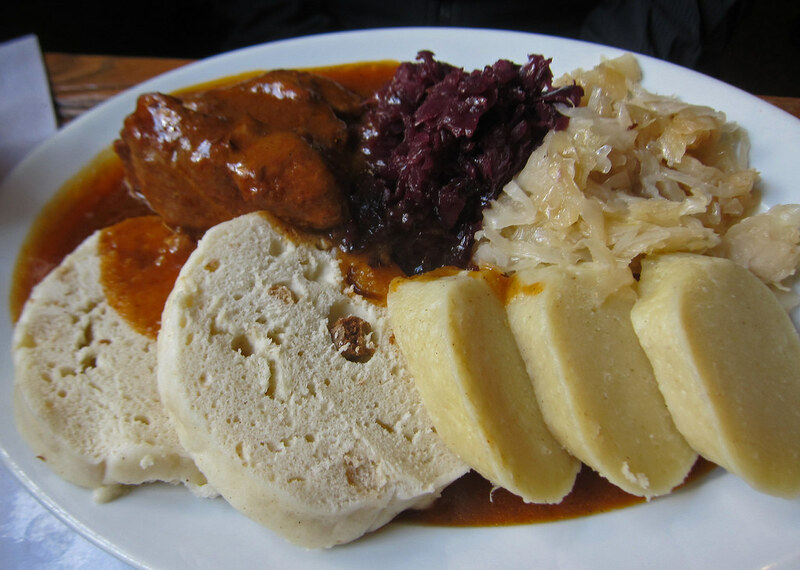 However, normally when we think about Prague food is not the first thing that comes up to our mind. So today, I’m gonna prove you that Czech cuisine can be, to your surprise, very interesting and what is more important, satisfy your tastes. Of course – each central european country has their own kind of Goulash. The original one comes from Hungary, however, its czech cusine is definitely the one to remember. Why? First of all, if you are vegetarin skip this part, it contains more meat and less veggies. Secondly, it is less spicy. Thirdly, it includes typical dumplings made of bread, which are dipped in this delicious soup/dish. 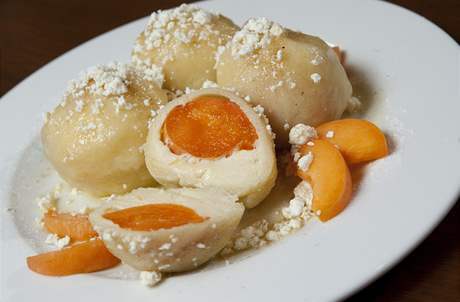 Knedliky – cause as a polish person, I love anything that could be similar to our dumplings! Typically you will find them together with goulash, but.. you can actually have them with marmelade inside! Yummy! Can you ask for more? Very typical food, which I’d strongly recommend for winter lunch, rather than late dinner! It will fill you up for few hours, so maybe then consider a glass of wine in the cathedral area to relax and enjoy your time! Kulajda – why would anyone recommend a simple soup? But the best one I’ve tried was one winter at the Xmas market. It became my lunch and dinner the same day… I’m getting hungry only by the thought of it. Vegetarians will find the Smažený Sýr as a pure paradise for their pallate. Cheese. Fried Cheese. Deep Fried Cheese. When you think it can’t get better – they have added potato salad or fries. Pure love. Last but not least – or the best. 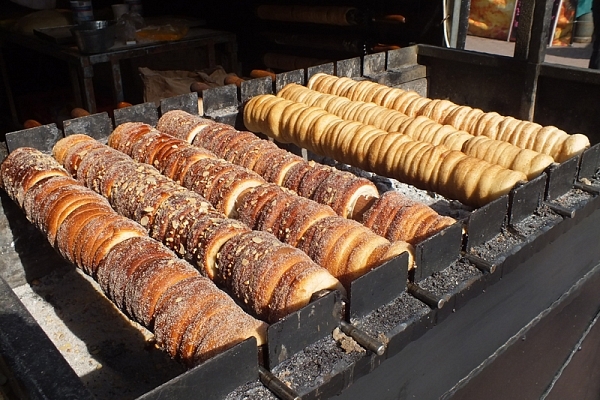 Yes, I have a lot of ‘the bests’ here – Trdelnik. Again very difficult to pronounce rolled pastry usually topped with sugar, cinnamon or nuts. Where will you find the best one – on the street. Do not dare pass it indifferently. Prices in Prague are usually very low, so going even to a fancy restaurant means actually very good quality for reasonable price. The best period to try the street food is Xmas to discover little markets with mulled beer and typical grilled sausages or above mentioned goulash. Try to go to Wencelas Square where you should be able to try the local dishes throughout the year! Comment your experience with Czech cuisine and tell me what was your unforgettable experience! That’s part of my plan to someday go to Prague as I find it very interesting! I hope lot’s of people can speak english? Prague is one of my favourite cities! It is a perfect place for a gateaway weekend and to relax, but also to see beautiful sights and try amazing food and beverages!